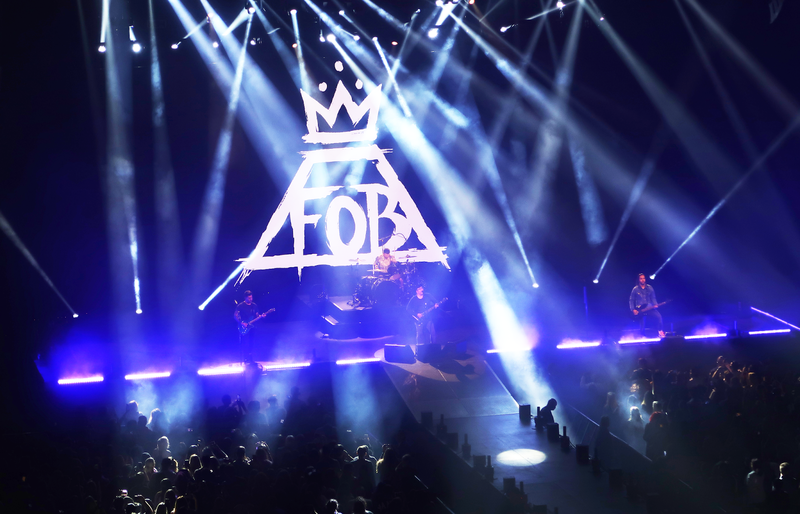 I finally got to see Fall Out Boy live in concert! It had been my dream to go see them for a while now. They were one of the bands that helped shape my teenage angst years. They made it seem cool to wear eyeliner, black clothes, and have bangs that cover one eye. They've made it cool to not be cool. In a way, we all sort of felt relieved to be a part of the "counter-culture" that the band seemed to promote, even though we were just misunderstood teens. I remember how I used to re-watch their music videos on Youtube over and over again. How I started listening to their music because my best friend in high school slipped their CD's into my locker. In a way, Fall Out Boy reminds me of my teenage years. They wrote songs that I could relate to as a teen. Now that I'm an adult, they still write songs that I can relate to. 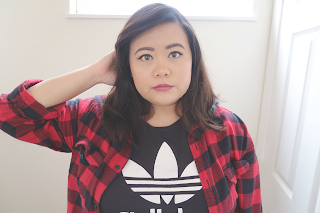 (Yes, I referred to myself as an adult.) It's always nice to see how you can grow alongside your favorite bands. The show was amazing and the fans in the audience were very passionate. I have never experienced such an engaged audience. I think this is the first show, that I've been to, where the fans sang along to every song at the top of their lungs. I ended up losing my voice the day after. I didn't really care about how well I could sing or if the person sitting next to me was going to judge me for my singing abilities. They would be singing even louder than I was. I just sang along with everyone because it felt like we were a team. We were a squad of people gathered in a stadium to show our support for our favorite band! I also got very lucky at this show. Christie and I both wanted to buy a t-shirt from the show. However, it seemed that the shirts that we wanted to get were all sold out. We stopped by one last booth before giving up, and they just so happened to have my size! So I bought the very last t-shirt at the booth! I felt quite accomplished. Here are my favorite photos that I took at the concert. I didn't end up taking many, and since we did sit on the upper level, some of the photos ended up blurry. I had to zoom in quite a bit with my camera to get the shots. 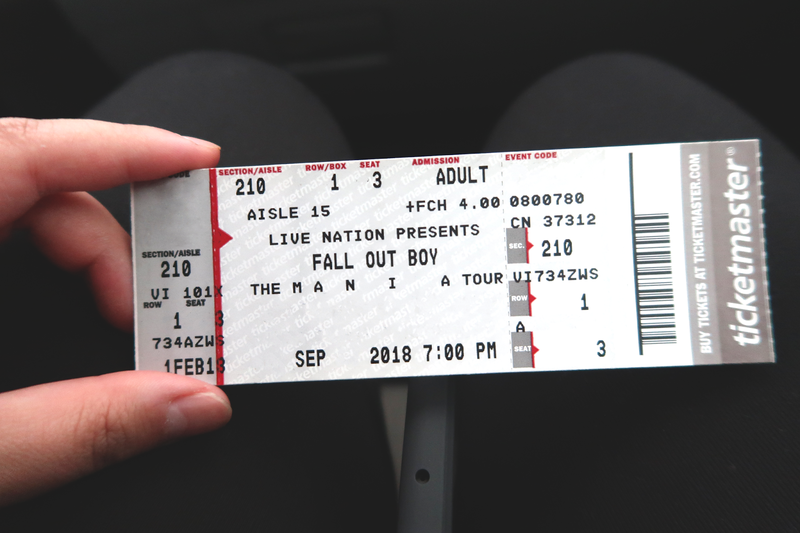 The ticket for the show. (I edited out some information.) I purchased the tickets right when the tour dates were announced in January. I've had the concert tickets for about 9 months. I'm not sure how I ended up getting this picture, but it came out relatively clear despite the low lighting situation and the zoom. This is by far, my favorite photo from that night. 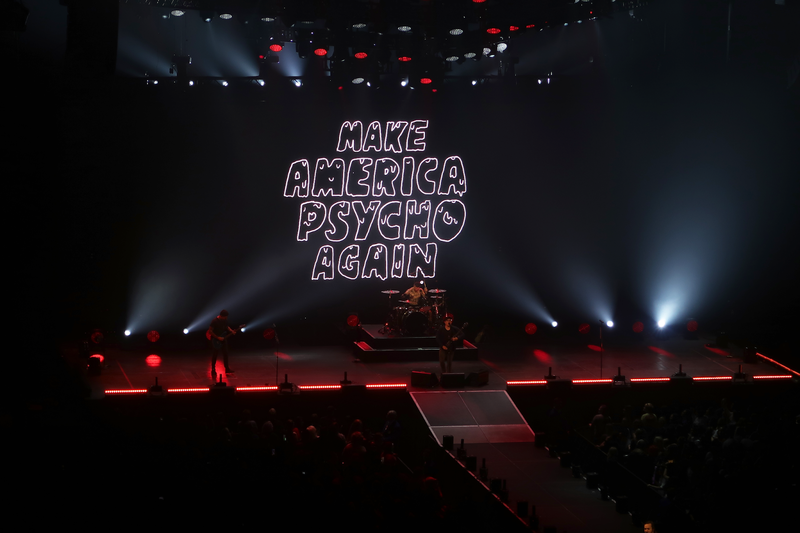 Fall Out Boy had various back drops during their show. I managed to get a picture of this before it disappeared from the screen. 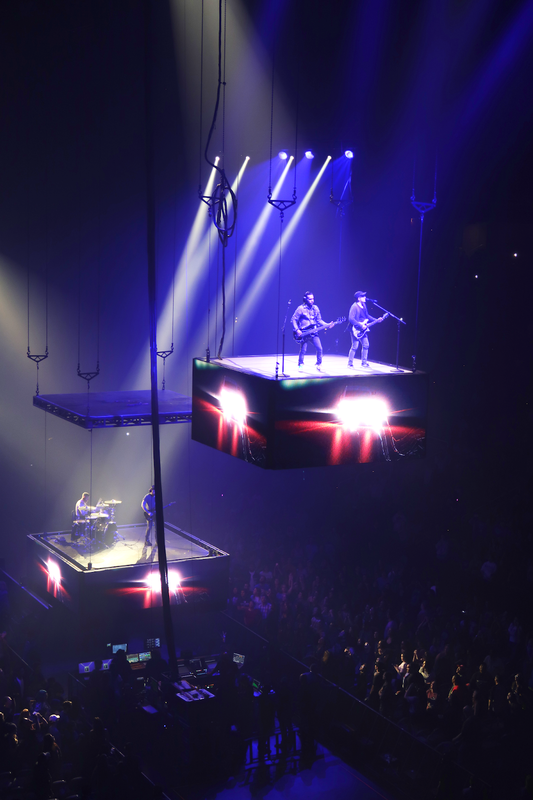 We were all deeply shocked when they appeared on floating stages. I still have no idea how they managed to get a full drum set on to that small stage. In the end, I almost didn't want to leave. The event just didn't seem real to me as I left the venue. It was like a dream that had ended too quickly. I have to admit, I had concert withdrawals the next day. (Something that I have never experienced before.) Now that my mind has been blown away by their performance, I look forward to the next concert or event. 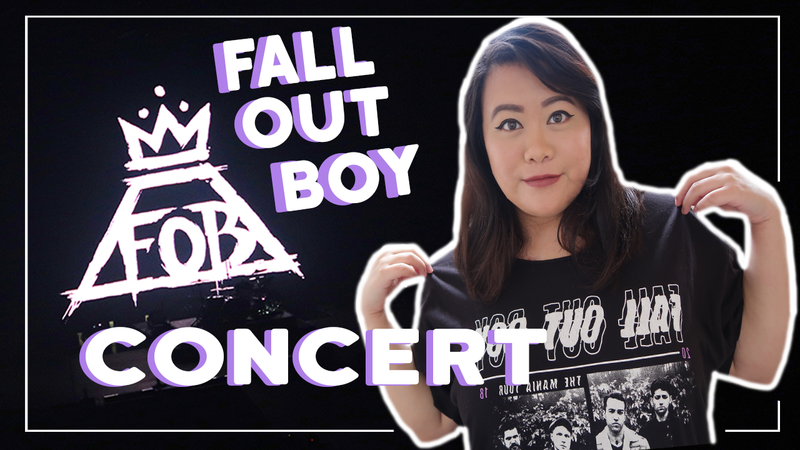 I wonder if it'll be as breath taking as this Fall Out Boy concert was or if this was a once in a lifetime experience.